Paper mill wastewater leads to a serious damage on the environment owing to the high content of organic matters, suspended solids, toxic substances, and lignin. Hence, exploring new treatment technologies is the passion of environmental engineers to minimize the effluent impact on the environment and cleaner production aspects. 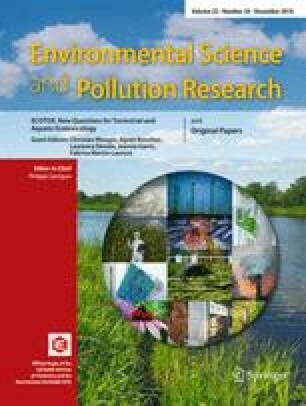 This research focused on the performance of full-scale coagulation-fluctuation/DAF system for pre-treatment of high strength wastepaper-recycling wastewater and its effect on biodegradability improvement. To optimize unit performance, optimum coagulant and flocculant doses were firstly determined by jar test without prior change and adjustment of pH in lab-scale experiments. The optimum dosages were obtained by 1500 mg L−1 polyaluminum chloride (PACl) as coagulant coupled with 40 mg L−1 cationic polyacrylamide (C-PAM) as flocculant. Percentage removals of 39 ± 10, 6.8 ± 3.6, 31.0 ± 6.7, 24.0 ± 3.8, and 33.0 ± 20.0 were achieved for COD, sCOD, BOD5, sBOD5, and color, respectively. The average BOD5 to COD ratio after pre-treatment increased from 0.44 to 0.5, whereas the ratio of sBOD5/sCOD dropped from 0.65 to 0.53. A superior effectiveness in reduction of TSS (98.1%) and VSS (98.4%) was also achieved. The results show that the application process is able to prevent malfunction operation in the following bioreactors which is obtainable through bio-treatability enhancement of pre-treated wastewater and reducing the risks of clogging and sludge washout. Attached growth processes are suggested to be applied in the further anaerobic/aerobic processes because of high proportion of soluble fraction of COD in the effluent to avoid poor floc formation and dispersed growth problems. The authors would like to thank the managers and staff of the factory for facilitating and providing financial supports to conduct this research. Also, the authors gratefully acknowledge Mr. Ahmad Zeighami for his comments, assistance, and enthusiastic support during sampling and water quality analysis. This study was funded by Kaghaz bazyaft wastepaper-recycling plant.